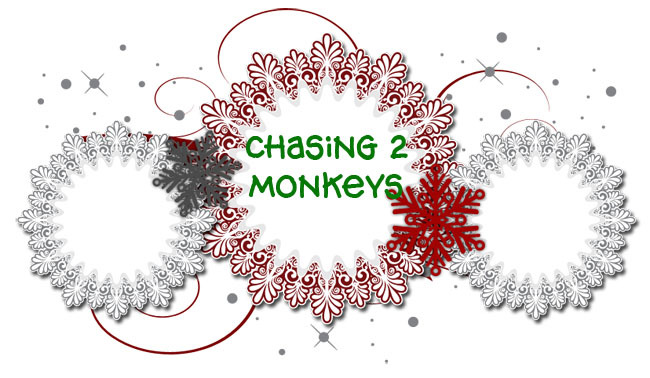 Chasing 2 Monkeys: Wreath Madness! Soooo many bloggers are sharing their amazing wreath projects right now, so I thought I would try to make one. I love the look of the yarn wrapped ones, so that was the style I chose to replicate. I wrapped a wreath I found at the Dollar Tree with some white yarn I had. And because I wanted it to represent my little family, I found a pair of super cute birdies (Dollar Tree again) and added those. On a trip to Michael's I found a pair of baby birds in a nest (sold in a pack of two for $3.99). But they only had three colors to choose from most of which were so munched up and ugly...So I picked the best looking package (they were an ugly burnt orange color) and painted the baby birds to match the bigger birds. I printed "Welcome to our Little Nest" on some scrapbook paper and hot glued twigs from our backyard to frame it. Then knotted some yarn around the top to hang in the middle of the wreath. The red felt hearts were an afterthought for this project. After adding everything else on, I felt that it was lacking something, so I dug around in my craft room until I came across the ton of red felt I have stocked up. Not bad for my very first wreath, eh?